Since we, rightfully so, in our opinion, chose to heap praise on Arnold's Cannes't video coverage of the festival and somehow recklessly neglected to mention the just as equally interesting Cannes Fringe coverage, we finally had to go to Cannes to find out what all this Cannes Fringe stuff is all about. Though we made in name only - and were rightfully dissed - with a mention in the latest Cannes Fringe coverage of the Shots party, we still feel like we were right there with the rest of the world's drunken ad industry. For it's fourth outing, Arnold's Cannes't team found Ogilvey's Nancy Vonk and Janet Kestin who spoke about their work on Grand Prix contender Dove Evolution and how it has affected their work for other clients. In a nutshell, many clients eye's were opened by the work and have become more willing to explore similar, non-traditional approaches to their advertising. Also explored in the video is Cannes night life. mostly a montage of joyful advertising bodies happy to be away from the office for a week, the segment does a nice job encapsulating the non-awards portion of Cannes. We still don't know about the tattoo or where Meredeth went. Alas, it was R/GA's Nike + iPod which won the coveted Cyber Lion. Arnold's Cannes't team has published its video take on the third day of Cannes in which they ask attendees why they travel to Cannes, what they expect to see, what they have seen and what value the festival offers. Lost purses, bicycle short, Arnold tattoos and a lengthy interview with Barbarian Group Founder Benjamin Palmer completes the video. If the Cannes't team keeps producing quality work like this, we may never have to go to Cannes ourselves to see what it's all about. Former JWT Toronto creative Sean Gallagher just won a Cannes Bronze Lion for his work on Wash Your Hands. Some of you may be familiar with the whacked Cannes oddity which requires you to actually buy the award you just won so Sean, who is no longer employed at JWT Toronto, is looking to raise money to buy the Lion. Which, itself is whacked, because we're sure JWT Toronto will be more than kind enough to pick up the tab. If not, well, that's just whacked too. Did we mention this business is whacked? - Advertising Age reports, "R/GA, New York, today won the Cyber Grand Prix for Nike Plus for best online advertising, and Unilever's "Evolution" by Ogilvy & Mather, Toronto, won the Grand Prix for best viral execution. The third Cyber Grand Prix, for best website, went to "Heidies," Diesel's spoof takeover of its site by two girls who supposedly hold a Diesel exec hostage, done by Aegis Group's Farfar, Stockholm." 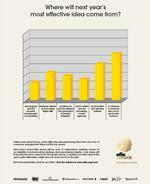 - Saatchi & Saatchi New York pulled in the Cannes Press Grand Prix for their Ultra Tide Stain Remover work. - View all the winners here. - Indie rock bad The Marvis has remixed one of the Jonas Moore Triumph videos. - Be sure to check out all the blatherific Cannes video coverage AdWeek is providing this week. - MediaBuys has has launched Media Campaign Wizard, a tool that manages the purchase of discounted media without commoditizing it auction-style. - Focus Features is promoting its upcoming film Talk to Me, starring Don Cheadle, with a social network. Focus has partnered with Going.com to its 300,000 members free tickets to special advance preview screenings of the film starting Wednesday, June 27, in New York, Boston, and San Francisco. - Dubbing Cannes the "International Ad Men Falling Over Each Other to Give Award-Winning Blow Jobs To Each Other" event, Copyranter is proud he's "live blogging from Cannes. 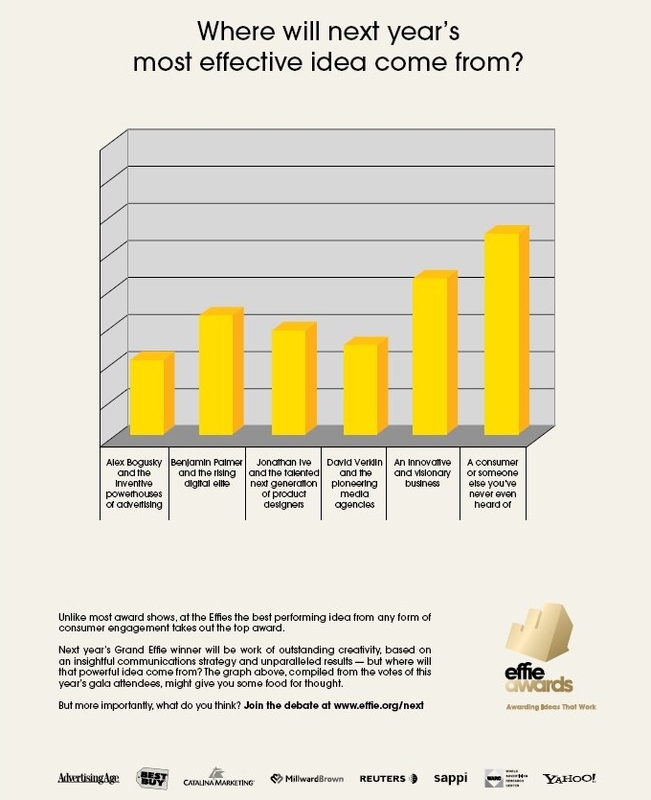 A new Effie ad asks the industry to cast there vote indicating where they think "next year's most effective idea will come from?" With comic-laden choices such as "Alex Bogusky and the inventive powerhouses of advertising" to "David Verklin and the pioneering media agencies to "A consumer or someone else you've never even heard of," the ad points people to a site on which they can place their vote. While the votes currently point to the consumer, we voted for Alex because, well, he's just so cool and we're a huge trend whore we couldn't help ourselves. Oh wait, that trend is over, right? This could be, by far, the best coverage of Cannes this side of the pond. Four folks from Arnold Worldwide have headed out to Cannes, launched a site called Cannes't and are publishing videos for the sole purpose of "figuring out what the hell this thing is all about." They're staying in a flat and already adopted a fifth Arnold employee who they found staying in a trashy hotel and invited to move in with them. There's interviews. There's "man on the street" coverage. There's wit. There's humor. There's small dogs. There's scootering. There's the beach! It's all good. Very nice work. For anyone who wishes they were there (uh, me) this is the best way to vicariously be there. Oh, and they've given the gutter bar perhaps the best nickname of all time: The United Nations on Crack. - Taking home the Cannes Promo Grand Prix is TBWA/Whybin Auckland for a piece of work for Adidas called "Bonded by Blood." - Former Strawberry Frog Amsterdam Executive Creative Director Al Kelly has joined Fallon Minneapolis as Executive Creative Director. - Yahoo CEO Terry Semel has resigned and will be replaced by Co-Founder Jerry Yang...who's now all grown up and can handle the job. Semel will become a non-exec chairman (what ever the hell that is) with former Exec VP of Advertising and Publishing stepping in as president. - During the Cannes Festival, AdWeek's AdFreak will be publishing LeFreaque, a blog written by jury members and general delegates who will share their experiences with readers. - Davis Freeberg questions Forbes' and Business Week's acceptance of ads promoting a questionable penny stock. - Pepsi shareholder launches Pepsi Planet, a site on which can find, or no apparent reason, a gallery of hot/sweet/beautiful/cute women , some posing with a Pepsi can or bottle. - If you simply can't stand it and absolutely must know the Cannes shortlists - which are far from short - for direct, promotional, media, press, outdoor and radio, they are here. - Win fame and publicity with Adobe's "Take Creative License" contest which will award publication in the September issue of Graphic Design USA for the designer who creates the best mash up from the Adobe Stock Photos library.